Carvedilol is used for hypertension, angina pectoris and in symptomatic heart failure. It has a short half life of 2h and bioavailability of 25%. Therefore the present investigation is concerned with the development of the buco-mucoadhesive films, which were designed to prolong the buccal residence time, to increase penetration through buccal mucosa and thus increase the bioavailability and its half life. Various formulations were developed by using release rate controlling film forming polymers like Eudragit RL-100, PVP, HPMC, NaCMC and Carbopol 934 in various combinations by solvent casting technique using plasticizer propylene glycol with and without penetration enhancers like DMSO, Tween 60 and castor oil. For unidirectional release, backing layer using ethyl cellulose 10%w/v in ethanol incorporated with propylene glycol as a plasticizer was casted on the films. The most satisfactory formulations had retained on buccal cavity for maximum duration of 10h, released for longer duration of dissolution beyond 12h which had maximum drug permeated during ex-vivo studies. During ex-vivo diffusion studies contributed formulation consisting DMSO as penetration enhancer which increase the drug permeability through buccal mucosa up to 15% was nominated as best formulation. The most satisfactory formulation followed zero order kinetics while the drug release mechanism was found to be anomalous diffusion confirmed by Scanning Electron Microscopy. The most satisfactory formulations showed no significant changes in the physicochemical parameters, in-vitro release pattern and ex-vivo diffusion studies during stability studies for two months. INTRODUCTION: Buccal delivery of drugs provides an attractive alternate to the oral route of drug administration, particularly in overcoming deficiencies associated with the latter mode of dosing. Mucoadhesive drug delivery systems are delivery systems which utilized the property of bioadhesion of certain polymers which become adhesive on hydration and hence can be used for targeting a drug to particular region of the body for extended period of time 1. Problems such as high first pass metabolism and drug degradation in the harsh gastrointestinal environment can be circumvented by administering the drug via the buccal route 2. Buccal films may be preferred over adhesive tablets in terms of flexibility and comforts 3. Buccal cavity has a wide variety of functions and it acts as an excellent site for the absorption of drugs. It provides direct entry of drug molecules in to the systemic circulation, thus avoiding hepatic first pass effect 4. Carvedilol is a non-selective and b-adrenergic antagonist with no intrinsic sympathomimetic activity widely used to treat essential hypertension and angina pectoris. Although it is completely absorbed from the gastrointestinal tract, the systemic availability is approximately 25-35% because of high first-pass metabolism. Carvedilol was selected as a model drug for the present investigation because of its oral therapeutic dose is low (6.25 - 25 mg), it’s having low molecular weight (406.48) 5, 6. A suitable buccal drug delivery system should be flexible and possess good bioadhesive properties, so that it can be retained in the oral cavity for the desired duration. In addition, it should release the drug in a predictable manner to elicit the required therapeutic response. MATERIALS AND METHODS: Carvedilol and Eudragit RL 100 were gifted by Sun pharmaceuticals, Baroda. Carbopol 934, Sodium Carboxymethylcellulose, and Hydroxypropyl Methylcellulose K15M were procured from Central Drug House (P) Ltd. PVP, Propylene glycol, DMSO was procured form Karnataka fine chem. All the other reagents were of the analytical grade. Preparation of Buccal Mucosa 7: Porcine buccal tissue from domestic pigs was obtained from local slaughter house and used within 2 h of slaughter. The tissue was stored in Krebs buffer at 4oC after collection. The epithelium was separated and allowed to equilibrate for one hour in receptor buffer to regain the lost elasticity. Preparation of Drug loaded Buccoadhesive films 8, 9: Buccal films were prepared by solvent casting technique. Carbopol 934 P, Eudragit RL 100, polyvinyl pyrrolidone (PVP), HPMC K15 and Na CMC were used in the preparation of films. Propylene glycol was used as a plasticizer. Dimethyl sulfoxide (DMSO), Tween-60 and castor oil was used as penetration enhancer. The polymers were dissolved in solvent mixture of acetone and isopropanol (3:2) by maintaining order (i. e.Eu- RL- 100 → P. V. P → Carbopol 934P) of addition of polymers to this after neutralization of carbopol, plasticizer was added and mixed. The drug was then dispersed uniformly in the viscous solution with continuous stirring. The resulting mass was poured into glass mould of 3cm in diameter. The moulds were left undisturbed at room temperature for one day. The films could be retrieved intact by slowly lifting from the moulds. Small films of 2 cm diameter, 0.2 to 0.3 mm thick and containing 12.50 mg of Carvedilol were taken out from the moulds. Backing membrane for unidirectional drug release was prepared by using ethyl cellulose 10% w/v was dissolved in ethanol and propylene glycol as a plasticizer casted 0.5 ml of the solution on dry films. Different formulations compositions are given in (Table 1). Physicochemical Evaluation of Carvedilol Buccal Films: The surface pH was determined by the method similar to that used by Bottenberg et al. A combined glass electrode was used for this purpose. The moisture uptake studies were carried out by using agar 5% w/v in hot water and solidified it. Three drug free patches from each formulation were selected and weighed. They were placed in vacuum oven overnight to remove moisture then incubated at 37 0C for one hour, removed and reweighed. The percentage moisture absorption was calculated using the formula, percentage moisture absorption = (final weight- initial weight)/ initial weight. Five samples from each batch were taken and thickness of each film was determined using “Dial Caliper”. Folding endurance of the film was determined by repeatedly folded at the same place, without breaking, gave the value of folding endurance. Determination of Residence Time: The in-vitro residence time was determined using a locally modified USP disintegration apparatus. The disintegration medium was 800ml isotonic phosphate buffer solution pH 6.8, maintains at 37°C ± 1°C 11. 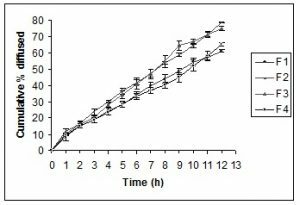 Drug content and Bioadhesive Strength of the Carvedilol Buccal Films: For drug content uniformity test 2 cm2 film was cut into small pieces, dissolved into 10 ml of methanol and diluted unto 100ml with the phosphate buffer (pH 6.8), and shaken continuously. Then filtered the solution, the drug was estimated spectrophotometrically at 240 nm after dilution. Bioadhesive strength of the buccal films was measured on the “Modified Physical Balance method” 12. In-vitro Release Studies of Carvedilol from Buccal Films: The drug release was determined using U.S.P. dissolution test apparatus (paddle over disk type) thermo stated at 37 ±10 C and stirred at a rate of 50 rpm. Sink condition was maintained throughout the study. Each film was fixed on glass slide with the help of Cyanoacrylate adhesive, so that the drug could be released only from upper face. The slide was immersed in the vessel containing 250 ml of phosphate buffer pH 6.8. Aliquots of 5 ml of sample were withdrawn with graduated pipette at every one hour time intervals up to 12 hours with equal volume of phosphate buffer 13 , 9. The sample were diluted with phosphate buffer and analyzed spectrophotometrically at 240nm and the cumulative amount of drug released at various time intervals was calculated. The test was carried out in triplicates. 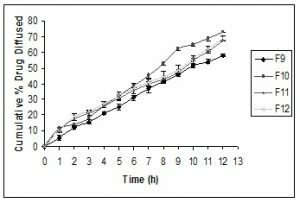 Ex- vivo Diffusion Studies by using Keshary- Chein Diffusion Cell: The diffusion study was carried out by using a K-C diffusion Cell. This study from buccal patches for different formulations through porcine buccal membrane was mounted over a K-C Cell whose internal diameter is 2.1 cm and a buccal patch was placed over it so as to secure the patch tightly from getting dislodge from the membrane. Reservoir compartment containing 25 ml phosphate buffer (pH7.4) and donor compartment containing phosphate buffer (pH 6.8). Diffusion cell was thermo stated at 37 ±10C and stirred at a rate of 50 rpm. Sink condition was maintained throughout the study. Aliquots of 1 ml of sample were withdrawn with pipette at every one hour time intervals up to 12 hours with equal volume of phosphate buffer. Aliquots were diluted and analyzed spectrophotometrically at 240nm and the cumulative amount of drug diffused at various time intervals was calculated. Stability Studies: The purpose of stability testing is to provide evidence on how the quality of a drug substance or drug product varies with time under the influence of a variety of environmental factors such as temperature, humidity, and light, and to establish a re-test period for the drug substance or a shelf life for the drug product and recommended storage conditions. To assess the drug and formulation stability, stability studies were done according to ICH guidelines Q1C 14. Stability studies were carried out on the films of most satisfactory as per ICH Guidelines Q1C. The most satisfactory formulation stored in sealed in aluminum foil. These were stored at 30oC ± 2oC, 65% ± 5% RH and 40oC ± 2oC, 75% ± 5% RH for 2 months. Films were evaluated for physical characteristics; mucoadhesive properties, in-vitro drug release ex-vivo diffusion study. RESULTS AND DISCUSSION: To ensure the compatibility of the drug with polymers preformulation studies were done using FT-IR. The IR characteristics of Carvedilol with the polymer resemble almost the IR structural characteristics of pure Carvedilol indicated the compatibility between the drug and polymers. 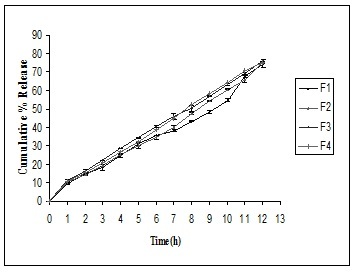 The values of evaluated parameters were within prescribed limits and indicated good Mucoadhesion time is given in Table 2. Surface pH of the formulation F1 to F12 varied from 5.84 ± 0.07 to 6.61 ± 0.1. The results revealed that all the formulations provide an acceptable pH in the range of 5.5 to 7.0 (salivary pH). Percentage moisture absorption showed the formulations F1, F2, F3 and F4 which contained Eudragit RL 100 and PVP was 34.6±3.7%, 37.13±1.8%, 35.38±3.5% and 27.07±1.8%; Formulations F5, F6, F7, and F8 which contained HPMC was 52.34±1.10%, 64.46±1.30%, 72.42±6.5% and 71.65±1.4%, where as Na CMC based formulations F9, F10, F11 and F12 was 32.31±1.23% to 43.34±3.82%. Eudragit RL 100 and PVP based formulations F1, F2, F3 and F4 showed less amount of percentage moisture absorbed, which could be due to percentage swelling property of Carbopol 934p was reduced by addition of Eudragit RL 100 9. Weight Uniformity of the developed formulations varied from 85.3 ± 1.2mg to 105.5 ± 4.2 mg. Thickness of the developed formulations F1 to F12 varied from 0.157 ± 0.008 to 0.236 ± 0.024mm which is within acceptable range. Folding Endurance of the developed formulations F1 to F12 varied from 138.8 ± 2.6 to 169.4 ± 3.00 times which are within acceptable range. Mucoadhesion time of the Eudragit RL 100 and PVP based formulation F1, F2, F3 and F4 varied from, 9.07 ± 0.05 h to 12.86 ± 0.26 h. Mucoadhesion time of the HPMC based formulation formulations F5, F6, F7 and F8 varied from 10.13 ± 0.15 to 11.86 ± 1.15 h. Mucoadhesion time of Na CMC based formulation s F9, F10, F11 and F12 varied from 9.08 ± 0.07 h to 11.48 ± 0.53 h. It may be due to presence of PVP in the formulations which would increase adhesive property 9. In-vitro Release Studies: The dissolution profiles of formulations are shown in Figure 1-3. The decreased in the amount of drug release from formulation F1, F2, F3 & F4 attributed to Eudragit RL-100 and PVP content as well as Carbopol 934 P as a bioadhesive polymer. It may be due to the percentage swelling property of Carbopol 934 P was reduced by increasing ratio of Eudragit RL-100 with PVP. The decrease in swelling causes a decrease in drug release from the matrix. The polymer erosion was rate controlling step in the drug release. When swellable polymer matrix was made by incorporating Eudragit RL-100 with the polymer solution, delay in dissolution of polymer occurs. This leads to controlled release of drugs from Mucoadhesive films. Ex- vivo Diffusion Studies: The drug diffusion studies of the formulations are shown in Figure 4-6. 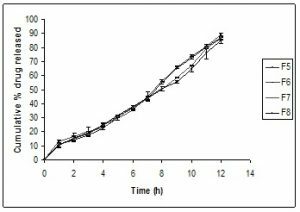 It was found that only 61.00 ± 0.74%, 56.00 ± 0.60% and 58.00 ± 0.60% from F1, F5 and F9 formulation respectively of the drug permeated through mucosa at the end of 12 hours. These formulations contained no penetration enhancers. 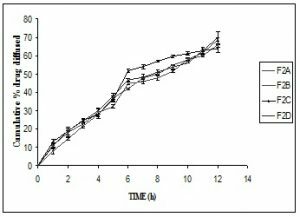 The buccal films F2, F6 and F10 containing DMSO as penetration enhancer showed highest drug diffusion 78.53 ± 0.6%, 72.00±1.41% and 54.25 ± 2.73% respectively. 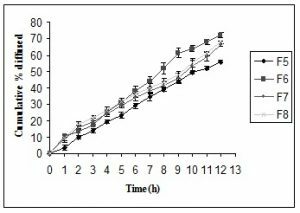 Formulation F3, F7 and F11 with Tween 60 as penetration enhancers were found 75.00±1.41%, 66.00±1.0 % and 67.57±0.60% drug diffused. Formulation F4, F8 and F12 with Castor oil as penetration enhancers were found 65.00±1.0%, 68.00 ± 0.74% and 69.00 ± 1.41% respectively. It has been concluded that formulation F2 gave lowest drug release profile for prolonged period of time and also showed highest diffusion release profile. Therefore F2 formulation selected as most satisfactory formulation. It has been concluded that permeation promoting activity of Non ionic surfactant like Tween 60 and Castor oil may be due to the reduction in surface tension, improvement in the wetting of skin and enhanced distribution of the drug 15. From among all developed formulations, since F2 formulation prolonged drug release for longer period of time up to 12 hrs. Drug diffusion found 78.53% highest was selected as the most satisfactory formulation. Stability Studies: The stability studies were carried out on the most satisfactory formulations F2 at 30 ± 2°C/ 65±5% RH and 40°C ± 2°C/ 75± 5% RH for two months to assess their long term stability as per ICH guidelines Q1C. At various time intervals of 30 days and 60 days samples were evaluated. There was no significant difference (p<0.05) in the physicochemical parameters, in-vitro drug release profiles and ex- vivo diffusion profiles were found to be super impossible with the initial readings at zero days results (Figure 7-8). CONCLUSION: This study demonstrated that a novel Buccal drug delivery system(BDDS) film composed of Carvedilol, carbopol-934, Eudragit-RL-100and PVP could incorporate DMSO as penetration enhancer. Thus, based on the above discussion, it is well justified to conclude that formulation F2 has the best effective formulation possessed the required physico-chemical properties, bioadhesion properties, moisture absorption studies, in -vitro drug release property and ex-vivo diffusion requirement for a controlled release formulation for Carvedilol. Therefore, Carvedilol film may be a potential formulation for the management of patients with chronic hypertension as well as long-term release formulation in the buccal drug delivery system. ACKNOWLEDGMENTS: We would like to thanks to Sun Pharma, Baroda for the generous gift of Carvedilol and Indian Institute of Science, Bangalore, for helping in the analytical study, chairman and principal, Acharya and B. M. Reddy college of Pharmacy for providing infrastructure facilitate for the work. Harris D, Robinson JR: Drug Delivery via the Mucous Membrane of the Oral Cavity. 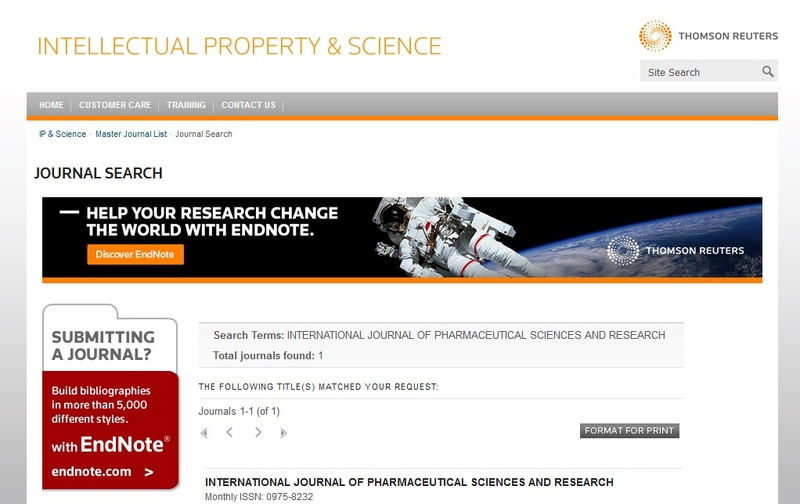 Journal of Pharma Sci. 1992; 81(1):1-10. 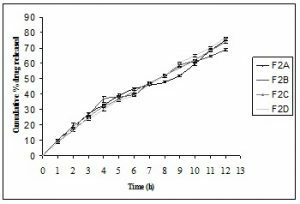 Semalty A, Bhojwani M, Bhatt GK, Gupta GD, Shrivastav AK: Design and evaluation of Mucoadhesive buccal films of Diltiazem hydrochloride. Indian J of Pharm Sci. 2005; 67(5): 548-552. Panigrahi L, Pattanaik S, Ghosal SK: Design and characterization of Mucoadhesive Buccal Patches of Diclofenac Sodium. Indian J of Pharm Sci. 2005; 67(3): 319-326. British Pharmacopoeia, Ed 2005: 1745. Martindale: The Complete Drug Reference. 34th Edition, Published by Pharmaceutical press. New York. 2004: 881. Rao YM, Vishnu YV, Chandrasekhar K, Ramesh G: Development of Mucoadhesive patches for buccal administration of Carvedilol. Current Drug Delivery. 2007; 4: 27-39. Khanna, R, Agrawal SP, Ahuja A: Preparation and Evaluation of Mucoadhesive Buccal Films of Clotrimazole for oral Candida infections. Indian J of Pharm Sci. 1997; 299-305. Doijad RC, Manvi FV, Malleshwara Rao VSN, Patel PS: Buccoadhesive Drug Delivery System of Isosorbide Dinitrate: Formulation and Evaluation. Indian J of Pharm Sci. 2006; 68(6):744-748. Khurana, R, Ahuja A, Khar RK: Development and Evaluation of mucoadhesive Films of Miconazole Nitrate. Indian J of Pharm Sci. 2000; 62: 447-453. Noha AN. Mucoadhesive drug delivery systems.I. Evaluation of Mucoadhesive polymers for buccal tablet formulation. Drug Dev and Ind Pharm. 2004; 30(9): 985-993. Gupta A, Garg S, Khar RK: Mucoadhesive Buccal Drug Delivery Systems: A Review. Indian Drugs. 1992; 29(13): 586-593. 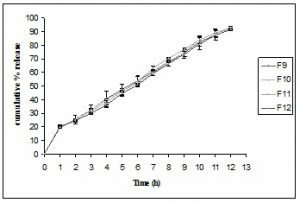 Ilango R, Kavimani S, Mullaicharam AR, Jayakar B: In-vitro studies on buccal strips of Glibenclamide using chitosan. Indian J of Pharm Sci. 1997; 232-235. Available from URL: http:// www.ich.org/ cache/ compo. 364-272-1.html. 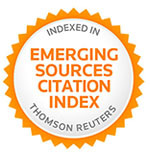 [online] [Cited 2006 Aug 27].